In this review we’re going to take a look at the Kohler C3-125 bidet seat. We would consider this bidet to be mid-level product that sits in the middle among all bidets in terms of function and price. By the end of the review, we hope you will walk away with an idea of whether or not this is the right bidet for you. So let’s get right into it! We’re going to start this review by taking a look at the design of the Kohler C3-125 in terms of its appearance, dimensions, and built. One of the first things you will notice about this bidet seat is that it’s quite clunky at the back. That’s because it uses a tank water heating system and that’s where the tank is located. With a tank water heating system, warm water is kept inside a reservoir so that it is ready to be used at all times. The great thing about this system is that you get warm water immediately from beginning to end of your wash cycle. The downside is that when warm water runs out, you have to wait for it to warm up again. And because water needs to be kept warm, this type of bidet generally uses more energy. Check out our comparison of the types of water heating systems to learn more about them. When shopping around for a bidet seat, one of the first things you might consider is if you want a bidet with an attached control panel or a remote control. There are advantages and disadvantages to both. For instance, with an attached control you need to make sure there’s enough space on the side of your toilet to install the seat, because the control is attached to the side of the toilet. 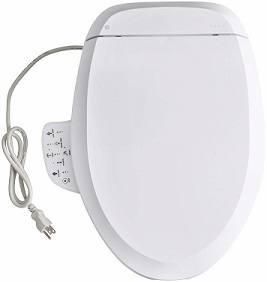 With a remote control, your toilet seat is more compact, but you need to replace the batteries inside the remote, and bidet seats with remotes are more expensive. The Kohler C3-125 uses an attached control panel to operate. On the panel, there are buttons for Stop, Air Temperature, Pulsate, Rear, Front, Water Temperature, and Seat Temperature. 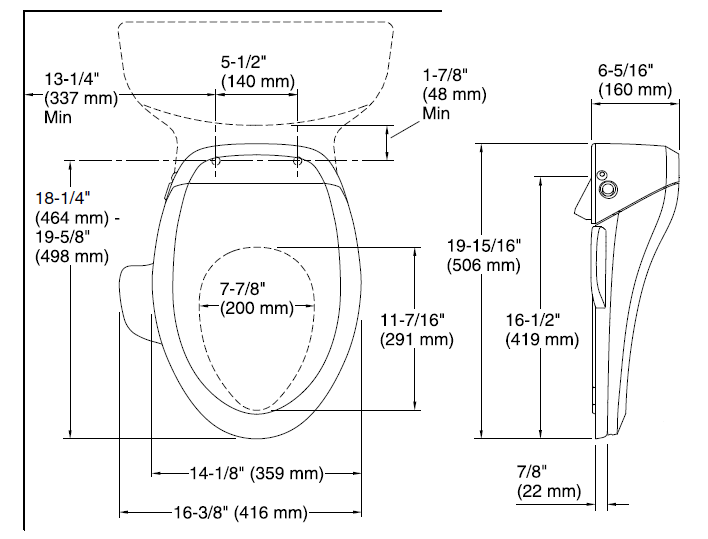 The Kohler C3-125 will only fit elongated toilets. It’s not designed for round toilets. Elongated toilets have an oval shape and are about 18.5 inches long from the mounting bolts at the back to the front, while round toilets have a circle shape and are about 16.5 inches long from the back. The dimensions of the Kohler C3-125 are 19-15/16” long, 16-3/8” wide, and 6-5/16” tall at the highest point in the back. The Kohler C3-125 comes in White or Biscuit. The Kohler C3-125 uses two separate nozzles: one for posterior cleaning and one for anterior cleaning for women. You can use the pulsating feature with the spray that alternates between high and low water pressures and feels like you’re being given a massage. The cleansing functions of the Kohler C3-125 are quite customizable. You can adjust the water temperature and pressure to 3 different levels. This bidet also features a heated seat that you can adjust to 3 different warmth levels. But many bidet seats allow you to customize these settings to 5 or even 6 levels, so that may leave some people wanting more. There is also a warm air dryer with this bidet, so including the heated seat and warm water wash, you have all the basic features that provide a comfortable washing experience. The air dryer is also adjustable – you can change the air speed and temperature. The one great surprise with this bidet is that it comes with a nightlight! Usually, you can’t get this feature with mid-priced bidet seats, so this is a cool surprise. With the nightlight, which is an LED light that illuminates the bowl, you can use the toilet during the night without having to switch on a bright bathroom light. To round things off, this bidet comes with an energy save function which will power down the seat after 24 hours without use, and turn it off completely after 48 hours without use. This could be useful for toilets that are not used as often. And the final feature we want to mention is that this bidet has a soft closing lid, so it can close quietly without slamming down. Will you need a hot water supply to use this bidet? The answer is no. 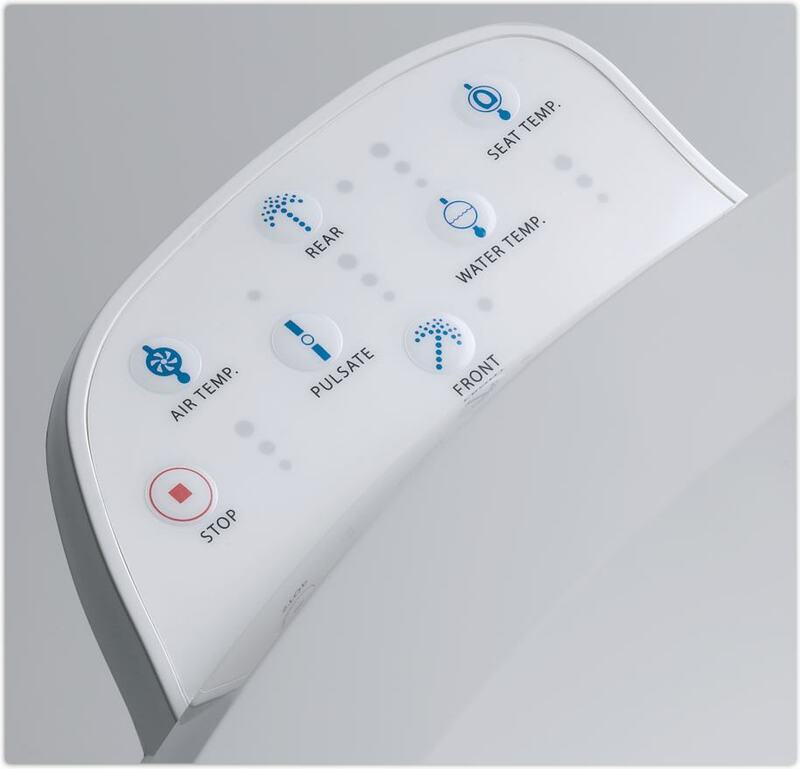 The toilet seat heats the water using the tank water heating system. But you will need to plug the seat into an electric outlet. Why the Kohler C3-125 bidet seat? Buying a bidet toilet seat is a huge investment. After all, you’re going to be sitting on it multiple times a year for many, many years. You have to make sure that you get one that suits your needs (which is why you’re reading this, of course!). To help with your decision, we put together some reasons why the Kohler C3-125 might be the one you’re looking for. The one thing that we don’t like about this bidet is the clunky tank at the back. Because this bidet uses a tank water heating system, it inevitably needs to have a reservoir where it can hold the water. And because it needs to keep warm water on hand at all times, it will likely be less energy efficient than bidets that use tankless heating. There are many good things going for this bidet. It’s jam packed with features – heated seat, warm water wash, warm air dryer, deodorizer, soft closing lid, and nightlight – yet it’s priced very competitively. If you don’t mind the clunky-looking water tank and would like a bidet with a tank water heating system, the Kohler C3-125 may be just what you’re looking for! You can buy this bidet online or at your local home improvement store.